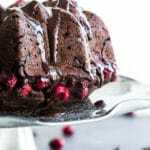 Dark Chocolate Cranberry Bundt Cake is the ultimate holiday dessert! It’s decadent and fudgy, and studded with dark chocolate chips and tart fresh cranberries. And best of all, it’s made in just one bowl! Pre-heat oven to 350F and grease a 10-inch bundt pan. In a large bowl, add the flour, sugar, cocoa, baking soda, salt and cinnamon and whisk together until well combined. If your cocoa is lumpy, you may want to sift together the ingredients. Pour in the milk, oil and vanilla, and stir until the dry ingredients are well incorporated. Fold in the cranberries and chocolate chips, and add the batter to the prepared pan. Reserve some cranberries to press into the batter around the edges of the cake. This adds a pretty detail around the bottom of the cake once it bakes up. Bake for 50 minutes, or until a tooth pick inserted in the middle of the cake comes out clean. Let cool in pan for 10 minutes before turning out onto a wire rack to cool completely. For the glaze, add the chocolate chips and coconut oil to a small microwave-safe bowl and microwave on high for two 30-second intervals, stirring in between. Stir until chocolate is smooth. Pour over cake and let harden, or serve immediately for a warm chocolate topping. Store leftovers in an airtight container and enjoy within 3-4 days, or freeze for later enjoyment. For a dairy-free and vegan version of this cake, use vegan chocolate chips. This cake freezes well. You can either wrap the entire cake and freeze, or cut the cake into slices and layer them between sheets of wax paper in a container. This makes it easier to grab a few slices and defrost for a quick dessert.